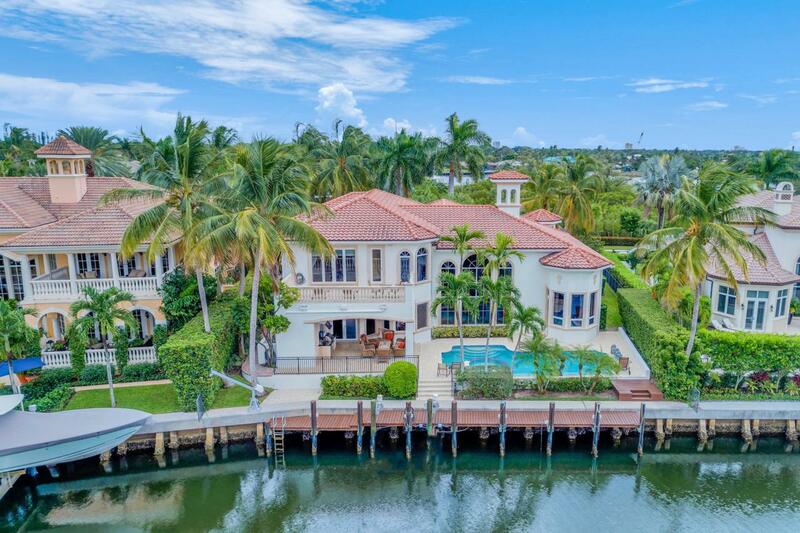 Luxury Custom Waterfront Estate home in Harbour Isles. Gated community.Expansive canal views.Private dock.90 ft water frontage. 30KW Generac Generator, 12,000LB High Tide lift. Next to nature preserve.4 bedroom 5 full Baths and 2 half baths, 4 car garage, pool and spa. Total sq. ft.8,222 Living sq.ft.6,113.All impact windows.4 new a/c units.Central vac. New water heater. Grand marble foyer into living room. Coffered hand painted ceilings. Custom crown molding. Custom chandeliers throughout. Vaulted ceilings.Custom wall accents.Plantation shutters.Laundry facilities on 1st and 2nd floor.24x24 marble flooring throughout 1st floor.Arched entries into rooms.Living room has floor to ceiling windows with patio and canal views, cast stone gas fireplace, chandelier, coffered ceilings, wet barwith marble counter tops, cabinetry and shelving. Large kitchen has all stainless steel appliances, including 6 burner natural gas stove, sub zero refrigerator with cabinet panels, wall microwave, double wall Dacor convection oven, dishwasher, double under mount stainless steel sink, granite counter tops with full granite backsplash, wood cabinetry, metal ceiling, recessed lighting , large island with sink and cabinetry, pantry, and door to side paver patio. Breakfast nook has chandelier, bamboo ceiling, cabinetry, view of patio and dock. Butlers pantry with granite counter tops, cabinetry with glass door accents, wine rack, wine cooler and chandelier.Family room has extensive built in shelving and cabinetry, custom tongue and groove ceilings, ceiling fan, French doors leading patio and pool and recessed lighting. Private foyer to 1st floor master bedroom with double door entry, hand scraped wood floors, sitting area, coffered ceilings, floor to ceiling windows overlooking pool, patio, canal and dock .Bonus/Media room redesigned as (hers) closet with wall to wall cabinetry, shoe storage, purse storage, center island, seating area, wet bar, make up area and dressing area.Large walk in (his) closet with built-ins.Attached master bath has marble floors, marble jetted tub, his and hers vanities and make up area, marble countertops and his and hers water closet with bidet.French doors lead to 1st floor office with extensive built in shelving, onyx counter tops, desk area, and ceiling fan with lighting.Winding staircase with wrought iron accents lead to 2nd floor lounge area with hand scraped wood flooring, billiard room, card area, granite bar that overlooks 1st floor and view of back patio, pool, lanai and summer kitchen.2nd floor balcony with water views.All three 2nd floor bedrooms have en suite bathrooms. .Large covered patio with tongue & groove ceiling. Custom ceiling fan. Summer kitchen with stainless steel grill, granite counter tops and refrigeration.Private dock .Close to shopping fine dining, recreation and entertainment. Convenient to Palm Beach International Airport.